There is always time for a good read when we’re on the road and so we wanted to share with you a list of the books that journeyed with us and kept our imaginations going. Some of which we have carried around the world because we wanted to have them on our bookshelf when we got back home. 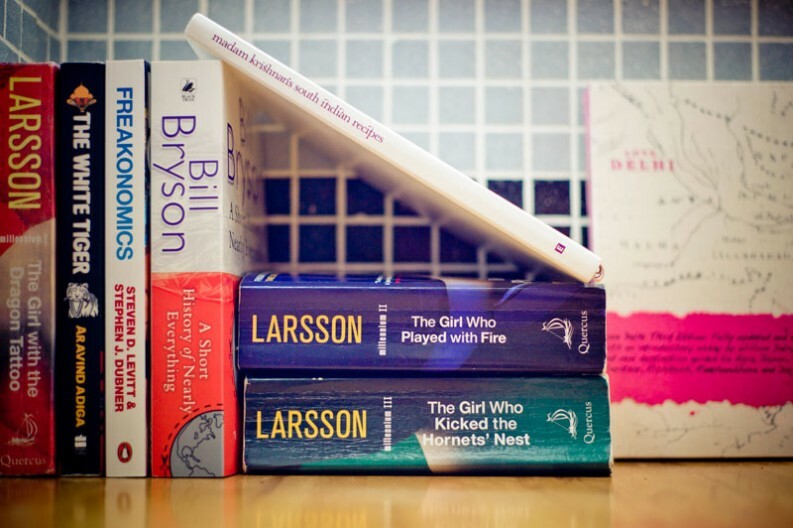 We did often find time to swap books at various book exchanges which tend to be more available throughout popular backpacker’s destinations in Asia and South-East Asia, although we did find a nice book exchange in Wellington, New Zealand. When we fist started getting into our reading days Dave bought a photo-copied version of Stieg Laarson’s Girl With the Dragon Tattoo. Little did we know just how epic this was going to be, we simply couldn’t wait to get onto The Girl Who Played with Fire and then the finale The Girl Who Kicked The Hornet’s Nest. The Millennium trilogy as it is now known is a must in everyone’s crime fiction lives! The millennium trilogy certainly got into our psyche, we talked about Salander like we knew her, like we wanted to be in the novels, Helen even dreamed it all out. Very bizarre how books become buried deep into the subconscious when you’re traveling! It took us a while to find anything that really had the same level of anticipation, thrill and story as the trilogy but eventually after some recommendations we found Jo Nesbo. Nesbo, another Scandinavian crime novelist has created detective Harry Hole, who after the first two novels really grows as an addictive troubled yet very successful character. By the time we’d managed to find more of the Nesbo novels we’d reached Nepal and so we got our mitts onto a copy of The Leopard which continued to inspire and grab our attention. Aside from thrilling fiction we found delight and imagination in The Time Traveler’s Wife by Audrey Niffenegger, it even provoked a few tears from Helen, but in all honesty that doesn’t take much. We got down to raw facts with Jon Krakauer’s Into Thin Air, which after our trekking in Nepal really struck a chord with both of us, we don’t think we’ll be attempting to summit Everest at any stage. To bring in some interesting facts Dave started reading Superfreakonomics by Levitt & Dubner, whilst Helen got stuck into the fascinating Indian tale of The White Tiger by Arvinda Adiga. And we both got to grips with George Orwell’s 1984, Big Brother is watching you! So we had quite a mixture of crime writing, thrillers, romantic novels, fun carefree novels and more factual informative writing. 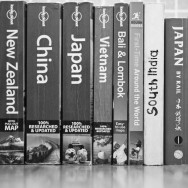 Along with the Lonely Planet travel guides at various stages we may have carried up to 5 books which did made us think about purchasing a Kindle next time we go away! However we do love something about the physicality of a book, an object containing thousands of written words within which we were able to lose ourselves and become a part of, tucked nicely into our day packs. 25 May ’12 Filed under News, Travel tips and tricks. Tagged book, fiction, notworkrelated, novel, novels, photography, read, reading, tips, travel, world. Bookmark the permalink. Post a comment. Leave a Trackback (URL).